Real Madrid boss Carlo Ancelotti describes 16th win as "a dream"
Real Madrid coach Carlo Ancelotti said he felt like he was dreaming as the La Liga leaders secured a club record 16th consecutive victory with a 2-1 win at Malaga on Saturday. Goals from Karim Benzema and Gareth Bale were enough to take the three points and beat the previous longest winning streak of 15 matches set in 1960-61 and 2011-12. "This is like a dream," Ancelotti said. "We are very happy with the run and hopefully it will continue." It was a rare game without a goal for Cristiano Ronaldo, who has 20 in the league already this season. The Portugal international assisted both goals, though, and Ancelotti added: "He did fantastic work and he was the key to the match. "It's unusual for him not to score but he did create two goals." 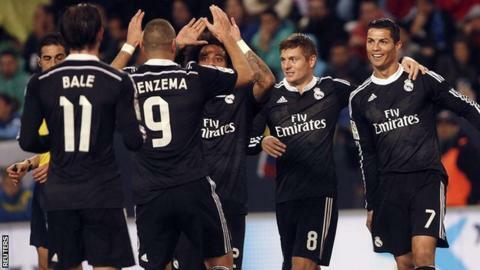 Real's form represents an impressive turnaround since the start of the season. They lost two of their first three league games, with some reports stating at the time that Ancelotti was starting to come under pressure. Their last defeat came on 13 September when they lost 2-1 at home to Atletico Madrid. Since then, Ancelotti's side have won 10 La Liga matches, five in the Champions League and one in the Copa del Rey. Real defender Sergio Ramos praised the influence Ancelotti has on the team, saying: "We have achieved an important record and it is a day to congratulate Ancelotti and all the squad. "He is the boss of this Real Madrid. There is a perfect calmness in the dressing room and that is fundamental for the team."